I listened (4 times) to another awesome awesome awesome sermon. I say that about every one I listen to, I know. This is another one by Tim Dilana from Brooklyn Tabernacle. And, these posts don’t do them justice, you must go listen. So good! These verses take place at the end of David’s life. David gathered all the decision makers together and humbled himself to share his story of collision between him and God. David shared with the leaders that he had intended and prepared to build a house, but God responded with “no”. 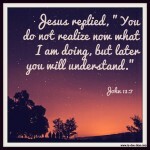 The verse that follows after God responded “no” starts with “But God said”. God had different plans for David and told David that instead of him building the house it would be Solomon. So, David intended and prepared, but God led him down a different path. Isn’t no one of the hardest words to hear? How did David respond to this? In verse 4, David reports to the leaders that God chose Him to be King. He recognizes that He was the chosen one. He doesn’t focus on the closed door, but still recognizes that despite it wasn’t the answer he wanted, God is still good and still blessed him. Instead of complaining, David recounts the blessing of God. Can we handle it when God tell us no? How will we react when God says no to us and it looks like He is saying yes to everyone around us? We see others having babies, others get promotions, others get nice new houses, yet He keeps shutting the door to our desires and requests. This goes all the way back from the first fall of man – Adam and Eve. They were told they could eat from any tree of the garden, except one. The enemy took their attention off the millions of trees they could touch and focused on the one tree they couldn’t touch. 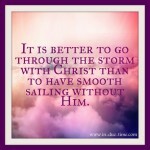 The one thing God said no to, overtook the millions of other blessings that God said yes to. We forget what He has done for us, because we focus on the one thing He hasn’t done for us. 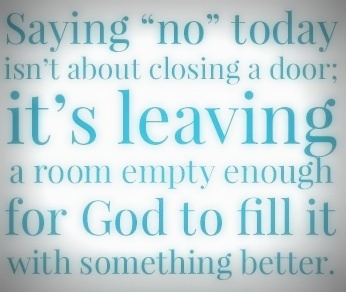 When in reality, the only reason He says no is because He has better plans for us. It’s clear that when we seek God wholeheartedly, He will close doors. But, as many times as He says no, it won’t even compare to the amount of times He tells us yes. We must have an attitude and perspective like David. When God closes doors, we need to praise Him. What if we asked “why me”? 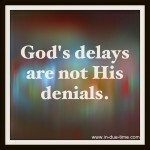 every time God blesses us, instead of only asking “why me”? every time He says no? We shouldn’t blame Him for the bad things, but instead give Him glory for the good things. We do not know what lies ahead for us on our infertility journey, but looking back we know that for now, God has already said no. Of course, we hope and pray it’s just a timing issue, but while we wait, we won’t respond with anger, doubt, or “why us?”, but we will continue to praise Him. We will try to maintain having an attitude similar to David’s and recount all the blessings He has said yes too. I stumbled here from the blogroll and thought I’d say hi. It sounds like you are in the depths of your journey, a place I can remember so clearly. I didn’t have the same faith that you do, nor the challenges of distance with my love. Have you read Sadie’s Blog – my little pebbles? Sheis the mama to twins after a long struggle with Male factor infertility. The path most definitely doesn’t always look like what we thought it would! WOW! That is soo amazing! When God saus no it is soo difficult. Fortunatly for me right now, well we are in a pretty low place, so I am so happy with all of God’s blessings. Such a good reminder! Thank youso much for your post! My DH’s fertility vitamin regimen came after a vasectomy reversal. He’d had a vasectomy 14 years ago, give or take. His #’s right after were low, which is why went to IVF, off the top of my head his volume was >1 million, 98% morphology (bad shape) and 98% immotility or 2% motility. After we started using the vits he was tested again and it went to 5 million, same morphology and motility. He was just tested again because we banked his sperm, just in case, and it was 15 million in volume, 8% motility. For some reason we weren’t able to get the morphology rate. And that is almost a year after the VR. So his regimen is: zinc, B 12’s (sub-lingual), multi-vits, magnesium, omega 3’s, D3’s, flax seeds and maca powder in the mornings- we got it all through our local health food stores and made sure the quality/dosage was high. I should also add that he’s vegan ( was vegetarian after surgery, vegan for about a year) but I don’t think that changes much, if anything it just means he has to be more mindful of protein and iron. They say calcium is also important but he gets enough through leafy greens. Hope that helps. We’re trying IVF again this January and it is nice to think his sperm #’s are up! Subfertile is 20 mil and under so he’s still technically infertile but I think it also helped him feel better about himself. hi I got the comment on my blog and see that foxy referenced me above. We did deal with azoo and had our twins using a donor and a medicated IUI. I’m happy to talk more with you and answer any questions you might have. I know exactly how hard and painful all of this is and the questions related to the role of God in all of this.